Chop onions,curry leaves,green chillis and ginger finely. Soak chana dal for half an hour in warm water. Heat oil and splutter mustard,urad dal.add green chillies,curry leaves and ginger.saute for a minute. Add this to the batter along with chopped onions.check whether salt is needed.if so,add it. If the batter is more sour,add 1/2 tsp sugar and more of green chillies.green chillies lessen sourness. Add soaked chana dal to the batter.Mix well. 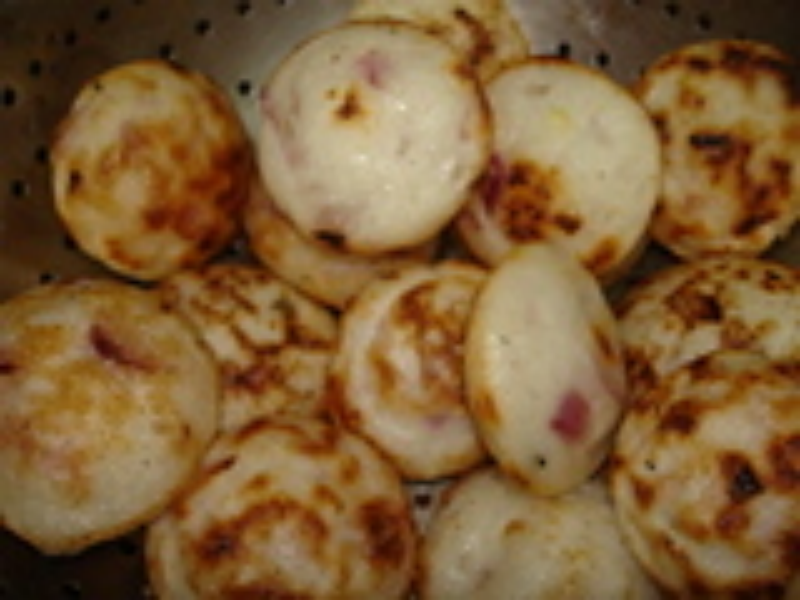 Rub the paniyaram mould(Pan) with onion and oil.Heat them,add 3/4th batter to it. Drizzle oil over it. and it will be cooked well and not sticky with the sides. Close the lid so that it will be cooked well. Flap it with the thin long spoon or long needle which u used to take out jilebi or murukku to other side. Both sides becomes brownish and crispy too. Not much oil is good for health.Kuzhipaniyaram is ready.Serve hot with chutney. Note:11/2 cup parboiled rice,1 cup raw rice,1/2 cup urad dal,fenugreek 1 tsp.wash and soak them for 2 hrs.Grind urad,rice seperately and at last mix them by adding salt.ferment overnight.This measure comes out well. Dear Ms.Srinidhi,thank u so much. Hi Rajeshwari, tried this recipe based on the quantities you gave and it turned out excellent...the whole family loved it!